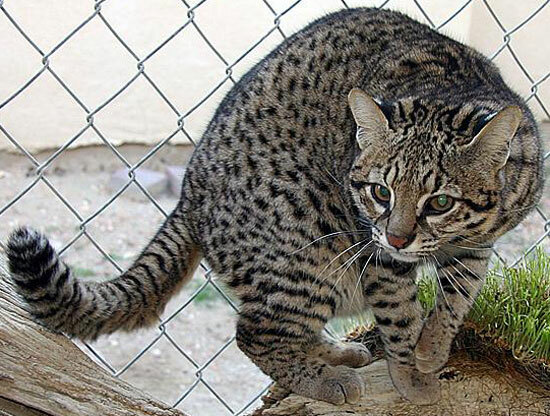 Geoffroy's Cat is probably the most common wild cat in South America. It is similar in size to a domestic cat. They have a body length between 42 and 66 cms (16.5 - 26 inches), a tail length between 24 and 36 cms (9.5 - 14 inches) and they weigh between 2 and 6 Kgs (4.5 - 13 lbs). In the north of their range the colour of their base coat is brown/yellow whilst in the southern part of their range it is grey. They are covered in black spots that merge into stripes around their neck, chest and face, and they have striped tails. It is not uncommon for completely black Geoffroy's cats to be found. They are good swimmers and very agile climbers. They are mainly nocturnal and usually sleep in trees or dense vegetation during the day. 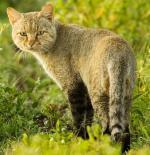 Geoffroy's Cats prefer thick cover and scrubland areas. They are found in Southern South America in the Andes, Pampas and Gran Chaco areas. They are solitary animals and they have a home range between 2 and 9 Kms (1.2 - 5.6 miles). Home ranges of females will overlap each other but ranges of male Geoffroy's Cats do not. The diet of a Geoffroy's Cat mainly consists of birds, fish, small mammals, reptiles and amphibians. 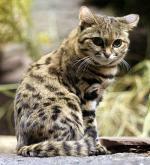 After a gestation period of 72 - 78 days a Geoffroy's cat will give birth to 1 - 3 kittens in a den located in a rocky area. At birth the kittens will weigh approximately 65g (2.3 oz) and within 10 days they will open their eyes. After about 6 weeks they will be fully mobile. Females will become sexually mature at 18 months, and males at 2 years of age. The main predator of a Geoffroy's Cat is man. Gato Montes - meaning cat of the mountains.